The is one of my favourite times of the year ... I love the whole build up, the kids excitement is infectious :) ... One of the best parts of christmas is the cooking and baking .... I don't often venture down the route of making my own mince pies, but this I have :) AND I am organised .. its December 1st and the Fruit mincemeat is made. What I failed to read in the recipe was that it made a generous portion, so we may be eating Fruit mincemeat till Easter lol :) The recipe is a Margaret Fulton recipe, so you know it will all work out :) So here is the recipe for Fruitmince and the Fruitmince Pies recipe is to follow ... ENJOY ! 1. Process dried fruit and almonds in batches in a food processor. Pulse to coarsely chop ( I actually didn’t do this as I wasn’t including the almonds, I just added the fruit as is). Spoon into a bowl and combine with grated apple, sugar, butter, brandy or run, spices and orange rind and juice. 2. Cover and chill, stirring daily, for at least 2 days before use. 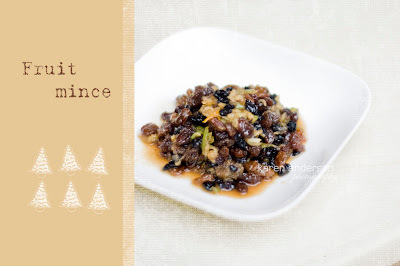 Note: This recipe makes a generous quantity of fruit mincemeat. If a smaller quantity is required, the recipe can be halved.